After 10 great days in South Bolivia, we headed for the west part of the country. It is true that Bolivia has a lot to see and discover. We didn’t imagine that Bolivia had such a beautiful places. The south has touched our hearts by the countless magical views, people, fauna and flora.And the more we read about the different places to visit in Bolivia, the more we feel like extending our stay in the country. For example, the north-estpart of the country offers excursions in the Amazon. Bolivia is one of the eight countries of the world’s richest biodiversity. About 35% of the global biodiversity is concentrated in the Bolivian Amazon forest also touching Brazil, Peru, Ecuador and Colombia. From the spectacular Andes to the dense rain-forests of the Amazon to the dry forests of the Chaco, Bolivia has more than 17% of its land as protected areas. We haven’t gone to the Amazon yet, but we will probably go in the Ecuadorian or Colombian part. The south-west part of Bolivia is the Andean region and the Cordillera occidental. The Cordillera offers a lot of possibilities for hiking, water rafting as well as biking and trekking. They call it the playground of Bolivia. More towards the Peruvian border, also located in the cordillera central, is the Lake Titicaca, the highest navigable lake in the world and the largest lake in South America which we have visited and will give further information below. The central Bolivia, around Cochabamba and Santa Cruz, has a lot of national parks lying half way between the tropical plains and the high altiplano. Cochabamba has a lot of Quechua Indians populations and traditional practices still alive such as ceremonies and the confections of typical dresses. This people are known for their friendliness and hospitality. Santa Cruz offer also a great combination of beautiful nature and ancestral history close to the Amazon basin and the Amboro National Park. Coroico is know to be a beautiful place in the middle of the rainforest, just below the national park Madidi. It is located 2 hours away from La Paz and is almost the final destination of the famous death road. We didn’t stop in La Paz. It is a fact that La Paz is the highest capital in the world, with an impressive location. 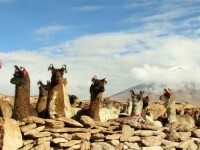 The city is surrounded by the Altiplano in the Andes, in altitude of 3640 meters. The views from the countless hills are incredible. What is less incredible is the security and dirtiness of the city. It is known to be quite dangerous and besides the city center and its funiculars, there is not much more to keep us there. We took the opportunity to give some free yoga classes to the guests. The atmosphere of the place was really relaxed and peaceful and gave the opportunity to meet very nice people. Along with a girl from Paraguay and and a Mexican guy we met on the second day, we went to visit the nearby waterfalls. We walked through coca plantations, as well as quinoa plantations. The great part of this short hike has been the view all the way to the waterfalls. We went through a local village that was still celebrating carnival. We, of course, got some soap on us and Lydie on the face ! After our experience in Sucré and Potosi, we are definitely not keen on the carnivals of Bolivia.. The day after we went to visit a Animal Rescue Center nearby the village. Bolivia has a lot of fauna and flora that we can admire all over the country. Unfortunately and very sadly, people sell illegally exotic birds, monkeys and other protected or endangered species. The animals found illegally in houses, fairs or black markets are taken away by the authorities and place into refuges for rehabilitation and maybe release in the nature again. When we got to the center, we have been impressed by the amount of birds and monkeys there. The birds were part of the family of the Ara and periquitos. They colors were simply beautiful and we felt lucky to be able to observe them. The monkeys were in majority Capuchinos, howler monkeys and spider monkeys. All very cute, we could take pictures and admire them. It was not recommended to touch them even though they are familiar with people. They have a program of rehabilitation for these animals that come in majority with a high degree of stress due to their captivity. These animals are reintroduce slowly if possible into their natural environment along with their species. We have had a great guide that could give us more information about each animal. We could really see he was passionate. It is possible to volunteer in the center for minimum two weeks. For anybody that would be interested, more info are on their website ! We then headed towards our last destination in Bolivia which is the lake Titicaca.The lake Titicaca is famous worldwide for being the highest lake in the world that we can navigate. From La Paz, it takes approximately 4 hours to get to Copacabana, a cute small city squeezed between the border of Boliva and Peru. The east part own to Bolivia and the west part to Peru. On the way to Copacabana, we could admire from the coast, the large and deep blue lake surrounded by the two countries. The view of the lake is incredible letting us compare it almost to the ocean due to the waves and the infinite view. Copacabana is a charming city to stop by for two days in order to enjoy the views around the Titicaca lake. It offers various restaurants to eat the famous local dishes La Trucha which is a local fish. It has also various artisanal shops where we can easily find typical Bolivian/Peruvian hats, jackets or scarfs. The area has different “cerros” (small mountains) we could climb to observe the view of the lake on the nearby island Isla del Sol that we will visit later on. The city has also a beautiful colonial church as well as a cute market selling local products. 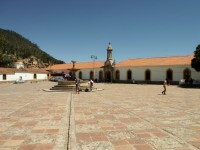 The main plaza is the best spot to observe the local activity which we always do when we get in a new place. We can then see the habits of people, the way they dress, the way they talk, sometimes we have a chat with someone sitting on the same bench as us. We love to take the time to sit and just observe. The day after, we took a 2 hours boat ride to go visit the island of the Sun – Isla Del Sol. We decided to stay two nights in Yumani, in the south, to be able to hike through the island. The contrast with the mainland is quite surprising. On Isla del Sol, we are back in time where people still use donkeys to transport their quinoa, sheeps and llamas for clothes confections. There are no cars on the island, just the sound of donkeys and other animals talking to each other. 🙂 What a calm and peacefulness time. The view from the island was even more impressing giving us a 360 degrees of the lake and a beautiful sunset on the first night. It was quite chilly at night, so we didn’t stay long outside and went to our small but cute hostel to rest and sleep with our sleeping bags and blankets! The day after we went on discovering the island from north to south which is about 7 kms long. We took a boat to the north from where we have headed down south. The north part of the island gives the opportunity to visit some Inca ruins and a museum for some explanation of the life of the incas on the island. The ruins are nothing impressive but give a good idea of the way people lived in the past. To visit the north the “local authority” charged us 10 BOB. The central part or more commonly called “the Inca trail” is 15 BOB and the south part is 5 BOB. It is a bit of an exaggeration or a tourist trap knowing the island is only 7 km long. Why to pay 3 times ? We felt a bit like a walking wallet but well, what can we do? This is always the question. After another good night sleep, we headed back toward Copacabana to catch our bus for Puno in Peru. We would have stayed longer in Bolivia but we have also allocated time to Peru. The time goes by too fast and we have the impression we have, at the end, not enough time to visit all the beautiful spots. We will come back for sure in Bolivia. This country is for sure a “coup de coeur”. Despite having a level of service (hotel, bus companies, restaurant) less good or efficient than other countries in South America, the variety of landscapes, the colors, the beauty of the country dealing with extreme altitude conditions leave us speechless. Bolivia is definitively a gold mine. Where to stay in Coroico: Sol y Luna, 110 BOB/night, double room, no breakfast included, pool, yoga space and relaxing area available. How to get to Coroico and Copacabana: From La Paz, by minibus to Coroico from the bus station called Minasa Terminal de Buses. 30 BOB/person/each way. By bus to Copacabana from the bus station Cemetery, 20 BOB/person/each way. Where to stay in Copacabana: Hostel Utuma, 100 BOB/ night, double room, breakfast, centrally located. Isla del Sol: reachable by speed boat, 25 BOB each way. Entrance fees in the south part of the island 5 BOB, 10 BOB in the north and 15 BOB for the Inca trail. Hostel Inti Wasi in Yumani, 160 BOB/night, double room, breakfast.